The basic driver of sea state is of course the wind. 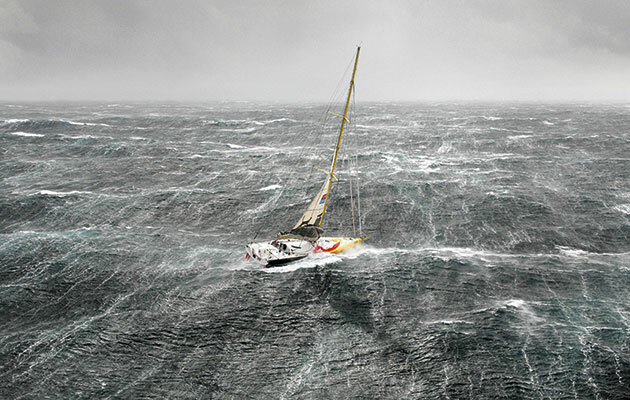 The stronger the wind, the greater the distance over which it blows unimpeded (termed the ‘fetch’), and the longer it blows for, the bigger the waves – up to a limit, for the wind strength. Waves – as our stomachs know – are not generally regular. A typical wind-driven wave pattern is a combination of many wave trains, each with different wave height (trough to crest) and period (the time interval between crests). When these combine, the result appears as groups of waves. Waves passing one spot will build to one or two big ones, and then diminish again before the cycle repeats, while a short distance away the same thing is happening, but not in step, so to speak, and the sea surface is a continuous grid of these fan-like wave groups. The pattern is often best appreciated from the air, in breezy conditions. 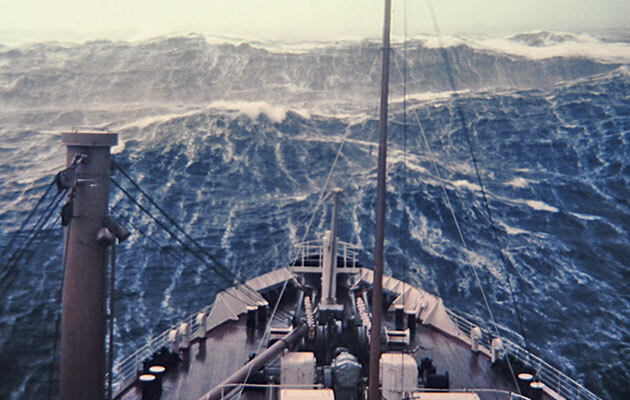 In a small vessel it’s often possible to steer between the groups in such a way as to dodge the biggest waves. If you’re watching waves break on a beach, it’s remarkable how often two or three big ones arrive in succession. In a random wave pattern, consisting of combinations of many wave trains of different heights and periods, about one wave in 25 will be twice the average height, and given several thousand waves – say 12 hours at sea – there is an excellent chance of meeting one three or even four times the average. Casually labelling these as ‘rogues’ or ‘freaks’, as the media often do, is thus not entirely appropriate, but it meets the need for sensational headlines. Significant wave height is the average of the highest one-third of waves. This is regarded as the figure of greatest interest to sailors, and it’s the one that’s quoted in buoy reports and wave height forecasts. Long waves with long periods move faster, survive longer and travel further, and the most extreme example of this is a tsunami. 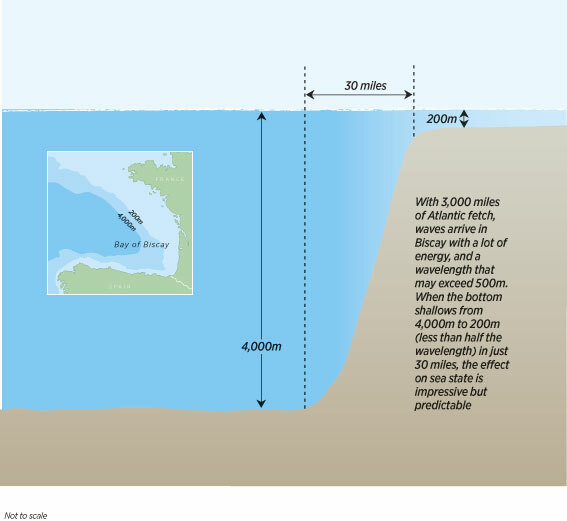 What causes dramatic sea states? With winds of Force 5 or so, a lot of the wave crests topple over and break, and this of course becomes more frequent and heavier as the wind gets stronger. But it’s not the only factor at work. Wave motion involves a disturbance in the water that extends down to about half the wavelength below the surface. A diver hovering underwater moves in a vertical circle as each wave passes. Except in breakers, there’s no net onward movement of water. 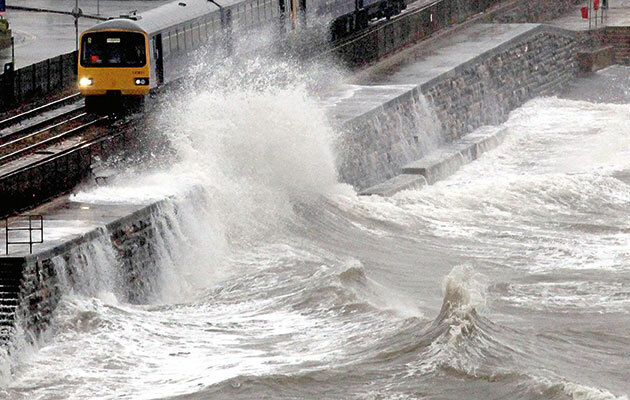 But when the water is moving bodily in the opposite direction, the wind-driven waves are effectively slowed so the energy transforms into shorter, steeper, higher waves – this is the wind-over-tide situation. 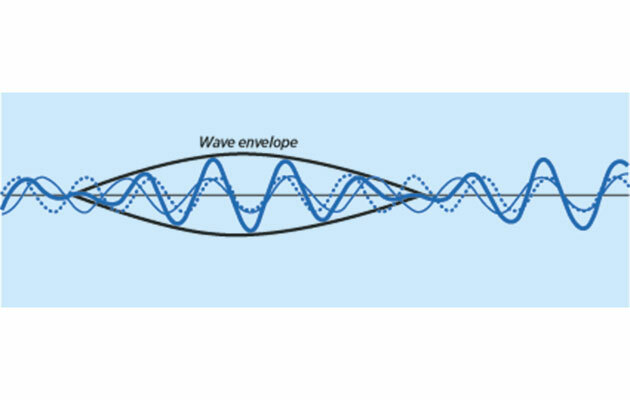 When the wave height to wavelength ratio is around 1:7, the waves break, forming overfalls. The converse is also true, but we tend not to notice. 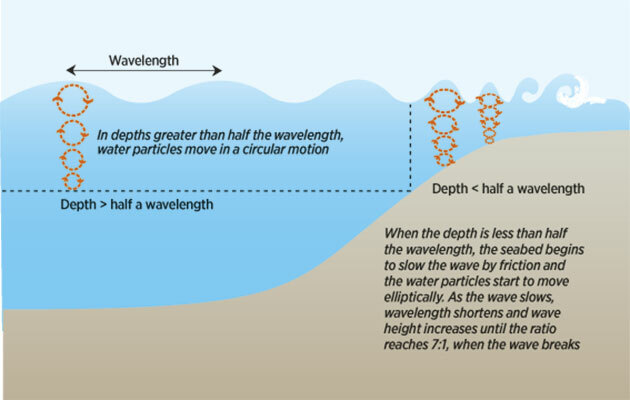 In water shallower than half the wavelength, the seabed starts to interfere. It slows the waves down, and again they pile up, getting shorter, steeper and higher. An underwater reef offshore can cause a bigger wave than usual to rear up, apparently out of nowhere, and break, sometimes with tremendous violence. 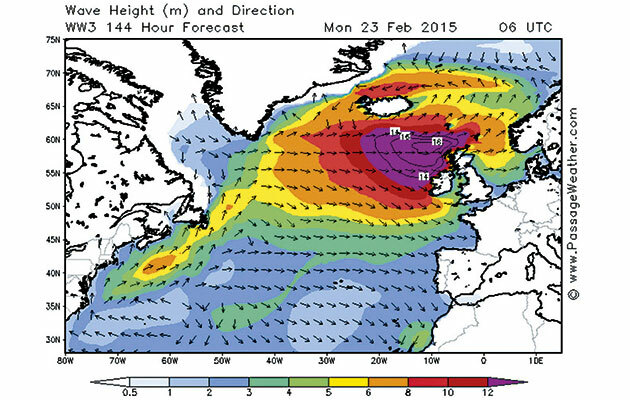 In the North Atlantic, the swell’s wavelength can be 500 metres or more, and because it’s the wavelength that influences the effect, it can happen in surprisingly deep water and with little warning. Even the edge of the continental shelf, 100-200 metres down, is less than half the wavelength so it affects the sea state (200 metres horizontally is only a good golf shot, after all) and this is one reason for the reputation of the Bay of Biscay. A river mouth bar provides the setting for the worst of both worlds – outgoing stream meets onshore waves over a shallow patch – while the combination of an irregular bottom, strong tide and exposure to heavy seas can be spectacular. READ New! 2019 Version of Marineforecaster Application is now live. In places like Corryvreckan, the Pentland Firth and Portland Bill, even in the absence of any wind or swell, the tide by itself creates a disturbed sea – a race – and there may be standing waves, which rear up continuously in the same place and can be almost wall-like. Waves impinging on cliffs with deep water at their foot tend to bounce back, and the result is a jumbled and chaotic sea state of dancing peaks and hollows. The French have a word for it: clapotis. The term is familiar to kayakers, who frequent places like that, but the clapotic sea state is strangely absent from the sailor’s vocabulary. 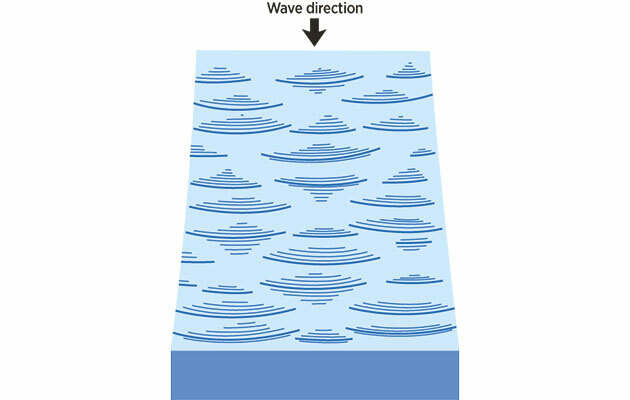 Waves radiate outwards in all directions over long distances from a storm centre, and as they travel, the component wave trains sort themselves out. The smaller, shorter waves quickly lose their energy and disappear, leaving the longer-period waves to reach coasts up to perhaps 1,000 miles away, in the form of swell. This long, regular roll from a distant storm may be quite unrelated to the wind-driven sea conditions locally, but it can have a big impact on passage planning, safety and comfort. If there is also a big local sea running in a different direction, a cross sea results, which can produce steep and dangerous waves. Because of their length, swell waves are also particularly prone to rearing up in shallow water. Surfers love them. They call them prowlers. There are several excellent forecast websites and, on the ones listed on the previous page, sea state reports are available from met buoys. Check pressure charts for the whole ocean, to see where the storm centres are and how they’re moving, and you’ll get a grasp of the influences at work generating swell. How does sea state affect your passage planning? Unless you’re a real glutton for punishment, you’ll prefer not to sail in steep and breaking seas. So do your homework and give an unavoidable wind-over-tide headland an extra-wide berth. Check the reports from met buoys, and look at sea state forecasts to see what swell conditions will be like. In a big sea, stay away from shallows and shoals. 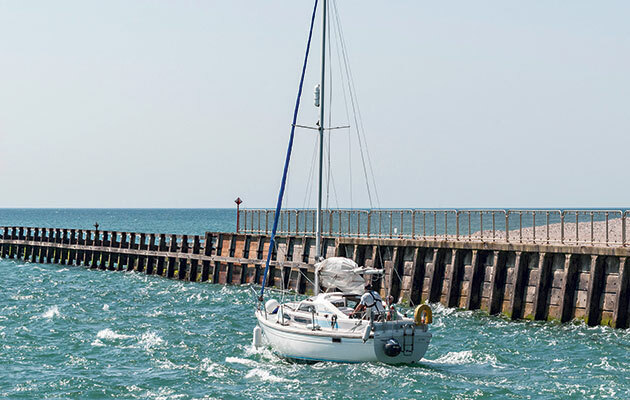 At harbour and river mouth bars, check the swell direction, and if things are marginal, try to time your entry for a high and rising tide. Some places and passages may have to be avoided altogether. A long (even barely perceptible) swell can make for a rolly and sleepless night at anchor, and swell waves are apt to be refracted round headlands, so bear in mind that an apparently sheltered bay may not be as snug as it looks on the chart. 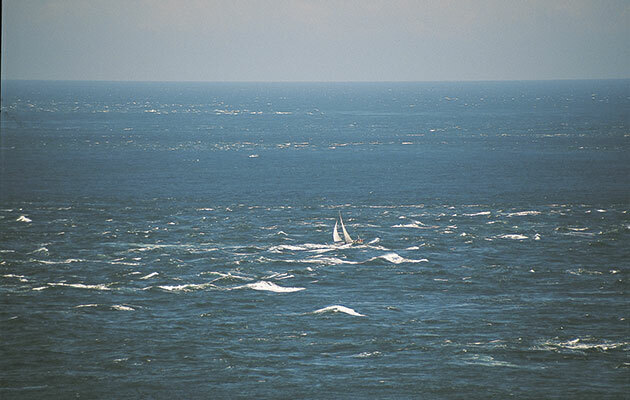 But when all’s said and done, there’s something very pleasant about the steady motion of a good boat in an ocean swell. A life on the ocean wave! Around Ireland, and in addition to the standard met buoys, seven navigational buoys measure conditions including sea state, and tweet the data every 20 minutes. See cil.ie. Phenomenal seas might occur two or three times in a winter, off Cornwall, the west of Ireland or Scotland, and in the northern North Sea. The highest recorded wave off the Irish coast was one of 25m, at the Kinsale Field gas rigs in February 2014. The post Understanding sea state for better passage planning appeared first on Yachting Monthly.